Fire? Yes, the fire which is taking away our forests. Not talking about what happened on our Earth in the past, I’ll directly talk about the recent ones because the list isn’t short. Kudos to us, The worthy humans. We’re always keen to get something more despite already having so many resources. And so we’re gifted with Carbon dioxide by nature not hiding other terrible shits like plenty of diseases, Carbon monoxide, etc. Reading the newspapers struck my mind, like every day, forest fire here, forest fire there. Here are some recent dreadful natural disasters(don’t know if actually natural) which might ask you to think about the current situations of Earth. California Wildfire – It started a week ago, and is still not in control. 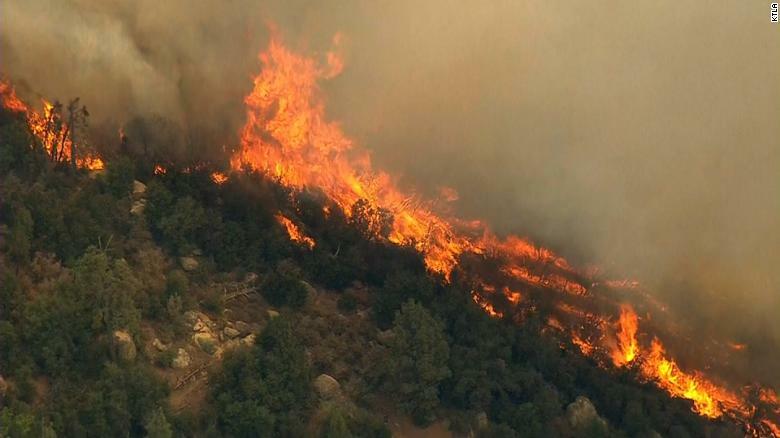 What CNN says is – Fire in California is so hot it’s creating its own weather system. Sweden Forest Fire – Started in late July because Sweden is experiencing intense heatwave. Thanks to recent rains, improvement is visible. Greece Wildfire – Also started in July only, this one was seriously deadly. While the source says it is not the act of God, but is due to corruption. Hawaii Volcano eruption – Started with an earthquake in may, Volcano eruptions and flow of lava are still unstoppable in Hawaii. And to be honest, this is one of the most shocking disasters of 2018. Here’s the latest update of another earthquake. So these are one of those few news about disasters happening throughout the world. For more, you can always read on Google or in the newspaper. So you understand the main purpose of sharing all this? The atmosphere above is not behaving in the right manner. Strong, hot, gusty winds are affecting thousands of cities around the world. And as we all know we’re too included(actually we’re the leaders) in this change, we must change, or this change will change us. Drought of Capetown, of several Indian cities, Melting of glaciers in Antartica is not hidden from us. Still, we’re not improving. Earth’s average surface temperature has risen about 2 degrees Fahrenheit during the last century. It’s on us how we use our natural resources without disturbing the stability of our Mother Earth. Like if you can help in improving the conditions, by doing basic activities like not wasting fuels, using public transport, switching off lights, fans when not in use, conserving water and planting trees, then I must say you’re a champion. But If you can’t contribute in making Earth a better place, don’t indulge in making it worse, Remain neutral. The fundamental principle is to save the natural resources we got from our ancestors. Well, Earth is burning, and everyone knows about this. Whether it be El Niño or Global Warming, the main culprit is ‘our activities’. Why do we want to make houses by cutting trees? Think again, without trees, there will be no use of those houses. Why do we can’t stop using plastics? It’s a reminder, persistent use of plastics without proper disposal recycling will only add to adverse living conditions. There are many such questions, but I know there’s no one to answer these. Recently, we inserted a net on our terrace to avoid pigeons coming there. This sort of thing generated both feelings, of sadness and happiness in me. Sadness, they used to make homes there, now they can’t. Happiness, For every time they made homes, because space there is not sufficient to fly, their new-borns started dying. The main question now is, Why are these birds building their homes in our places? I think you know the answer. They are finding it difficult to find a suitable home for them because we destroyed the forests, right? Animals are learning from us. They learned how to destroy someone’s home and make a place to live there. Thou here, these animals do not cause much destruction except for themselves(Sorry, little ones). What we’ve right now might not be available to our future generations. But because we know we can make a house at Mars, we’re becoming ignorant towards our nature. Remember, Evolution took place before too and is always taking place. Nature is the supreme leader, we might think we’re superior to nature, but hey……. we’re just 10,000 years old while Earth is more than 500 million years old, can you think you can beat this Super-experienced Earth and its nature? Think 10000 times. Previous Previous post: We can cry! as no one else recognize such distinctive approximately my difficulty. It feels bad to see our earth dying because of our habits. This made me think thrice about what we are doing. from Humble Tx! Just wanted to mention keep up the excellent job!